Last time I looked Massive Attack were a soulful triphop band (before triphop was invented) with guest vocalists singing above clever breaks, loops and beats. Last night they were incredibly heavy techno-dub, calling to mind the likes of Scorn, God (the band), Techno Animal or Godflesh more than anything else. Playing – often just in silhouette – against an overbusy screen full of statistics, current headlines, airport departure information, slogans, flags and statements, this was a very loud, bass-heavy, sensory and information overload. Support band Young Fathers had already surprised the audience with their energetic electro-rap performance. Cabarat Voltaire -esque loops and prepared tapes were overlaid with live drums, percussion and a skilful blend of three frontmen’s voices. There’s a confidence and swagger here, despite the simplicity of their lo-fi approach, which unfortunately isn’t captured on their Cocoa Sugar CD. Let’s hope down the line they can capture their live dynamics in the studio. Young Fathers were just one of the guests singing for Massive Attack throughout the evening; and the big sound of double drumkits, two keyboard set-ups along with guitar and bass added a depth at odds with their postpunk set up. They could do with checking out Schleimer K’s first LP, or early Fashion before they went commercial. Anyway, Massive Attack have clearly found fellow travellers in both Young Fathers and Azekel, who sang bottom of the bill and also guested later. If at times the sheer relentlessness of the bass and visuals was too much, the band’s obvious delight in texture, dynamics, sound and song always brought one back to the groove, if not a critical political debate that (I assume) the visuals were meant to provoke. It’s an odd dilemma and an unanswerable question: does simply re-presenting, collaging and juxtaposing media and political information to a dope- and alcohol-fuelled crowd of dancing middle-aged people change anything? Or is it just electric dance music? On one level, I don’t care, I had an enjoyable, exciting and entertaining evening at Eden, but it’s clear the band are politicised through and through. We were all given an anti-war newspaper on the way out, all – I suspect – wondering how to process what we had just seen, beyond being part of the audience. U2 and others get panned in the press for trying to change the world yet, despite a vague similarity to the Zoo TV screen’s flashing slogans, this felt very different in approach. Perhaps the information overload here acts as a kind of cleansing ritual, leaving us all room to think? At home today, revisiting recent Massive Attack recordings, it’s hard to see how the studio material becomes so different on stage. It’s certainly more than sheer volume, and it certainly made for a brilliant night out. 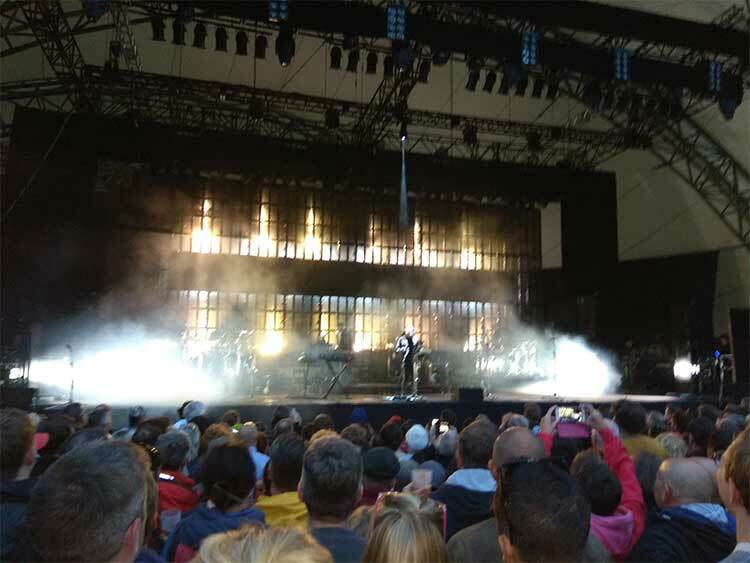 This entry was posted on 20 June, 2018 in homepage and tagged Ben Pugsley, Eden Project, Massive Attack, Rupert Loydell. Bookmark the permalink.